Welcome to another episode of Book Ends, the podcast for writers and book lovers. This episode is a rather momentous one.....not only is the guest the first cartoonist on the show.....but he's also the first bloke on the programme too! In this episode, I am in conversation with cartoonist Adrian Teal, author of The Gin Lane Gazette, which was a successful crowd-funded project for independent publisher Unbound. It was printed in hardback for supporters of the project at the end of 2012 and the trade edition has just been launched in UK book stores this week. Ade has been drawing caricatures for as long as he can remember and learned the craft in the workshop of Spitting Image, a satirical puppet show shown on television from 1984 to 1996. 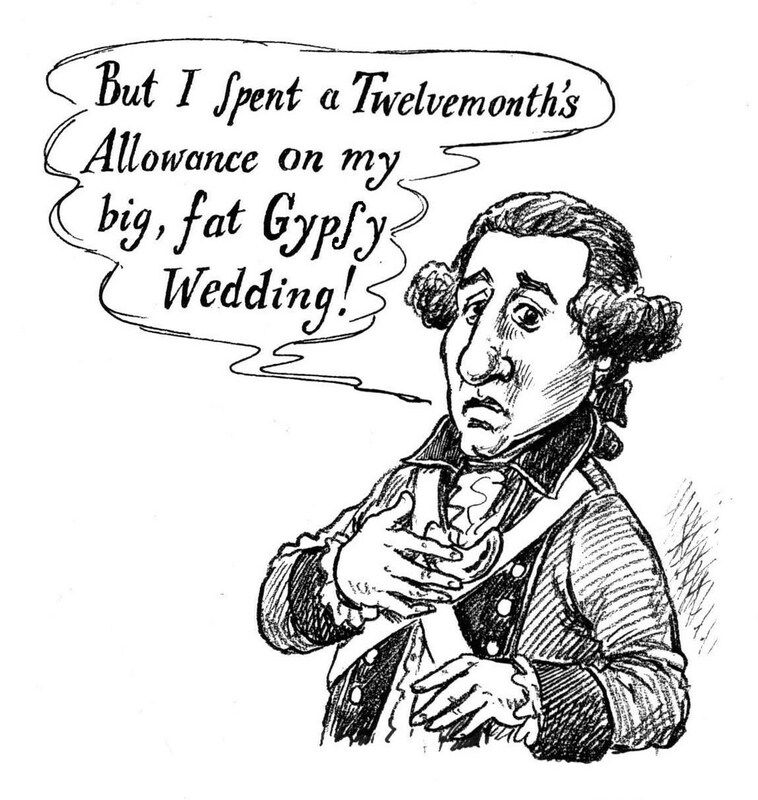 Always interested in the eighteenth-century thanks to an early obsession with the film The Bounty and mutineer Fletcher Christian, Ade worked as a political cartoonist for newspapers and then for historical publications until he came up with the idea for a fictional Georgian tabloid using real life events and figures. The result is the very funny and clever Gin Lane Gazette, which Ade describes as "an eighteenth-century version of Heat magazine" full of eccentric larger-than-life personalities, scandal and gossip....and all of them are true stories. You can hear all of the above hilarious true tales in the podcast! On the road to publication, Ade's brilliant book hit a few roadblocks when he approached mainstream publishers - he was told his idea was too risky and quirky for their lists - but his answer eventually came in the form of crowd-funding his book with independent publishing company Unbound. "Crowd-funding and subscription publishing is actually a very eighteenth-century concept," Ade explains. "Authors would get enough people to order advance copies of their book and once they had enough, the book got printed. Unbound is now doing the same thing for the internet-age." As with all Unbound projects, Gin Lane Gazette supporters were able to choose from varying levels of pledges - £20 got you a first-edition hardback copy of the book, £85 got you a signed copy of the book and your likeness appearing in its pages. In fact, I spotted a few familiar faces! It's a great way of bringing readers and authors together and getting readers more involved in the publication process where they can make a visible and meaningful contribution to a book they really want to see in print. 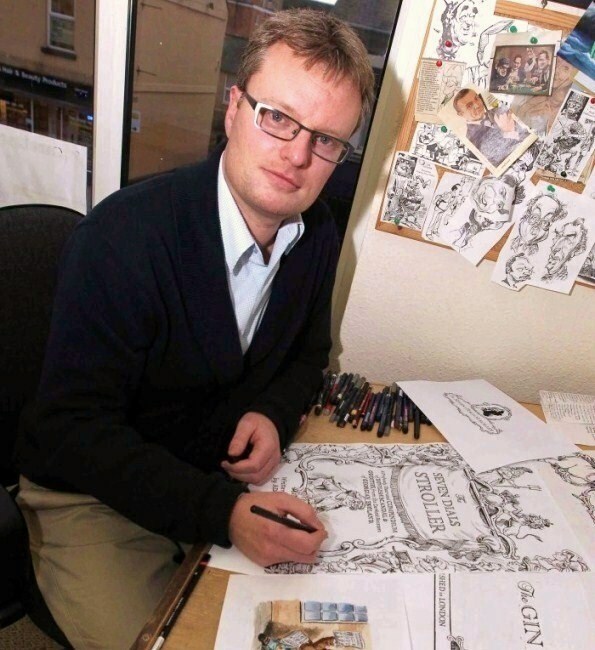 In this interview, in addition to sharing the journey of The Gin Lane Gazette, Ade shares some advice and tricks of the trade for budding caricaturists (he uses and recommends Edding 1800 Profipens) and the typical working day of a cartoonist. And will there be a Gin Lane Gazette II? Listen to the interview to find out! Many thanks to Ade for giving up an afternoon to chat with me and also to the staff at the Cowper and Newton Museum in the charming village of Olney, Buckinghamshire, who kindly let us record the interview on location. Being the home of eighteenth-century poet William Cowper it was most fortuitous and appropriate! are copyright Adrian Teal and used with permission.